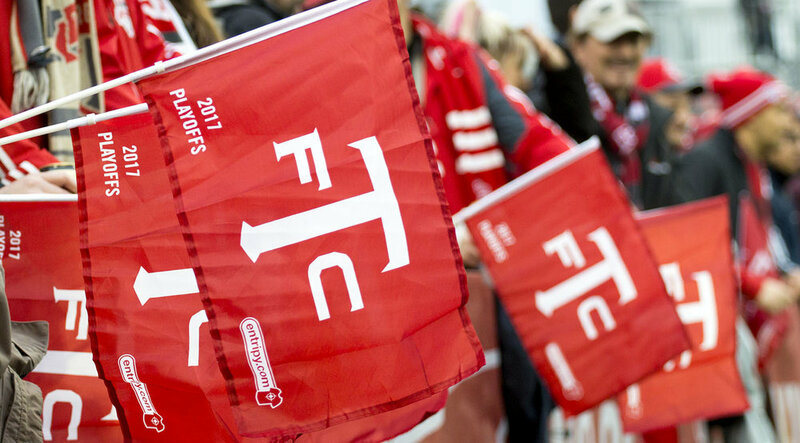 Flags hang over the north end of BMO Field ahead of the 2017 Major League Soccer playoffs for Toronto FC. Image by Dennis Marciniak of denMAR Media. Jonathan Osorio on the ball during warm ups for Toronto FC at BMO Field. Image by Dennis Marciniak of denMAR Media. REDEMPTION 90 MIN AT A TIME TIFO made by the South End Supporter's groups ahead of a 2017 playoff match with the New York Red Bulls at BMO Field. Image by Dennis Marciniak of denMAR Media. Sebastian Giovinco tries to get the ball past two NYRB defenders during a 2017 MLS playoff game. Image by Dennis Marciniak of denMAR Media. Jozy Altidore goes down to ground as the first official Chris Penso checks on him. Image by Dennis Marciniak of denMAR Media. The South End Supporter's section supporting the club for the full 90 minutes during a playoff match with NYRB in 2017. Image by Dennis Marciniak of denMAR Media. 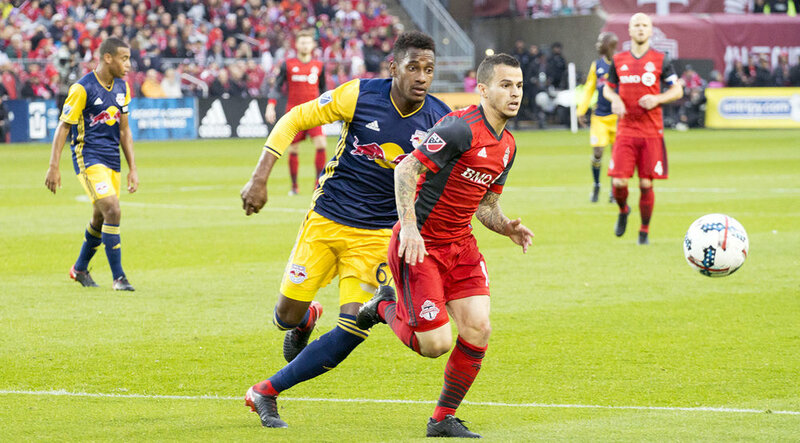 Sebastian Giovinco tries to play past a New York Red Bulls player at BMO Field. Image by Dennis Marciniak of denMAR Media. Justin Morrow gets the ball down towards the attacking half during a 2017 MLS playoff match against the New York Red Bulls. Image by Dennis Marciniak of denMAR Media. Sebastian Giovinco is taken down to ground as he attempts to get to the ball surrounded by three NYRB players. Image by Dennis Marciniak of denMAR Media. South end supporter's going crazy over Chris Penso's calls during the first half of MLS playoff action at BMO Field in 2017. Image by Dennis Marciniak of denMAR Media. Sebastian Giovinco clears the ball as a NYRB player look on during a playoff match in 2017. Image by Dennis Marciniak of denMAR Media. Players go up into the air for a ball in front of the south end at BMO Field. Image by Dennis Marciniak of denMAR Media. A south end capo giving the finger to the first official Chris Penso for disaterous offciating during the first half of the TFC v NYRB match at BMO Field in 2017. Image by Dennis Marciniak of denMAR Media. Marky Delgado on the ball in the attacking third during a Toronto FC playoff match in 2017. Image by Dennis Marciniak of denMAR Media. Two NYRB players argue with Víctor Vázquez Solsona during a playoff match in 2017 at BMO Field. Image by Dennis Marciniak of denMAR Media. Luis Robles attempts to keep the ball out of the net with his head during a 2017 playoff match against Toronto FC. Image by Dennis Marciniak of denMAR Media. Luis Robles and Marky Delgado argue with the first official Chris Penso as to whether the ball went past the goal line or not. Image by Dennis Marciniak of denMAR Media. Chris Penso gives Sebastian Giovinco a yellow card in the pouring rain as the match gets out of control. Image by Dennis Marciniak of denMAR Media. Sebastian Giovinco going to take a corner in the pouring rain at BMO Field in Toronto, Canada. Image by Dennis Marciniak of denMAR Media. Sebastian Giovinco goes to ground and has a relax as the pouring rain comes down on him during a playoff match in 2017. Image by Dennis Marciniak of denMAR Media. The south end supporter's section throwing confetti into the air. Image by Dennis Marciniak of denMAR Media. 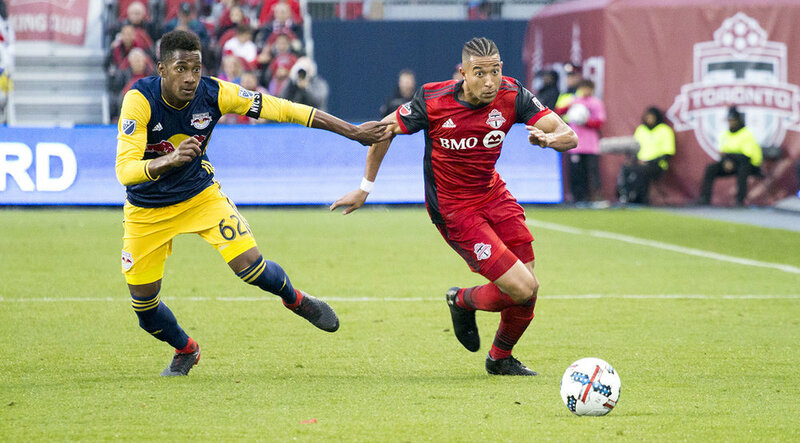 A Toronto FC and New York Red Bull player argue with the first official Chris Penso as he explains a call to both players. Image by Dennis Marciniak of denMAR Media. Jonathan Osorio tries to block the ball from being cleared in a Major League Soccer playoff match in 2017. Image by Dennis Marciniak of denMAR Media. A NYRB and Toronto FC player go into the air for a header during a rainy match in 2017. Image by Dennis Marciniak of denMAR Media. Sebastian Giovino and Michael Bradley give each other a hug in the rain after advancing 2-2 on away goals to the next round of the MLS playoffs. 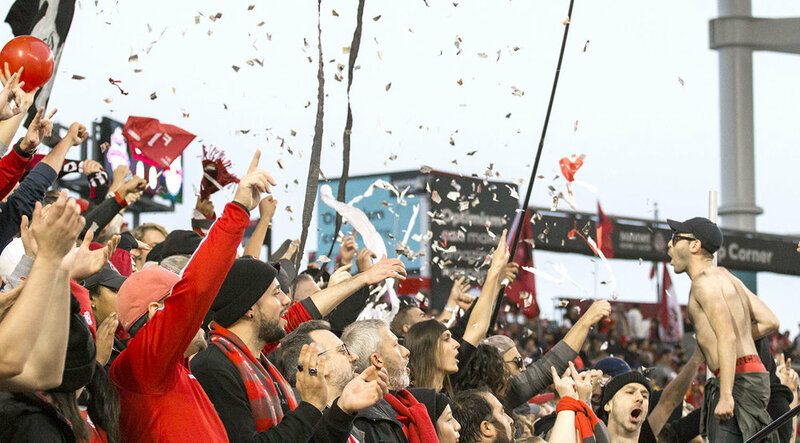 Alex Bono celebrates with the south end at BMO Field during a playoff match in 2017. Confetti on the ground as Toronto FC advances to the 2017 East Conference Finals in Major League Soccer. Image by Dennis Marciniak of denMAR Media.